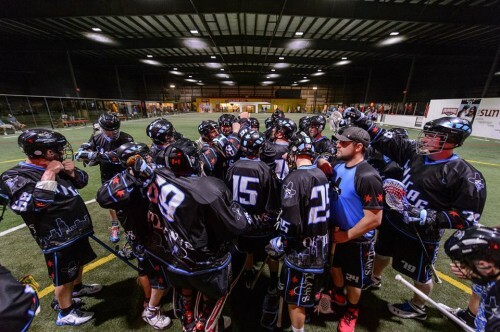 The Chicago Outlaws (1-0), proud members of the Continental Indoor Lacrosse League (www.ci2l.com), defeated the Indianapolis Copperheads (0-5) 26-8 at the SportONE Parkview Icehouse on Sunday, August 23. This season started exactly where last season ended, with Chuck Czerkawski winning the faceoff. Chuck would go on to win 23 of the 29 faceoffs he took. The game got off at a fast pace with a lot of back and forth transition, until Ryan Shahidehpour got the ball from a nice cross-floor pass where he was able to bury it top shelf. No. 77’s goal got things started as the offense started to click once we broke the seal. The Outlaws controlled the first half with solid picks and good off-ball movement. The first quarter ended with the score Outlaws 6, Copperheads 1. The second quarter got started quickly as Czerkawski won a faceoff and hustled down the floor to score a goal. This got the Copperheads fired up as they came back to test Outlaws’ goaltender, Desmond Bailey, with several chances that Des turned away. The defensive strength was able to get the Outlaws’ offense rolling again as they finished the quarter outscoring the Copperheads 7-2. The score at the end of the half was Outlaws 13, Copperheads 3. Bailey would end the half stopping 13 of the 16 shots he faced. Brian Larsen started the second half in cage and the Copperheads come out hot with four unanswered shots on goal. However, Larsen was on top of it stopping all four shots. Mason Poage would get his game in gear by scoring his first of three goals in the third quarter with a nice dink and dump beating the Copperheads Goalie top shelf. The Outlaws would continuewith a solid defensive quarter; while we were held to four goals in the third we also held the Copperheads to two. The third quarter ended with some jawing back and forth, which seemed to have got our guys to snap back into gear. The fourth quarter was a scoring frenzy with 12 of the 34 game’s goals being scored in the final 15 minutes of play. The Outlaws got it started with some great ball movement and was able to hit Dylan Weber down low setting him up to grind out a goal, something Weber has made a name for himself with. The Outlaws would go on to play a physical final quarter and outscore the Copperheads 9-3 and take home a 26-8 victory. Defensive Player of the Game: No. 12 Chuck Czerkawski winning 23 of his 29 faceoffs, earning 12 ground balls and three points. The Outlaws return to action next weekend when they travel to the CILL Grand Valley Showcase on August 29 and 30. They will look to improve their record with games against the Lansing Hot Rods as well as a rematch of the 2014 CILL Cup against the Grand Rapids Dragonfish.